Still nursing a ligament injury in his left ankle, Monster Energy Yamaha Factory Racing’s Romain Febvre managed to finish his home Grand Prix, round ten of the FIM MXGP World Championship at Saint Jean d’Angely in France, inside the top five, while Wilvo Yamaha Official MXGP’s Jeremy Seewer and Shaun Simpson made up the top-ten. Overnight rain and thunderstorms battered the clay-based, hilly French circuit, which made the track rougher, and the ruts longer and deeper than usual. The Saint Jean d’Angely circuit has many tricky and tight left-hand turns and this didn’t work in favor of Romain Febvre who was careful not to dab his left foot. With a slightly more cautious approach to race due to the depth of the ruts, Febvre couldn’t quite run his usual pace. After having another rider lean on him down the start straight in Race 1, which cost him a couple of positions, he managed pull through the pain and stiffness of his ankle injury for an admirable seventh place finish. 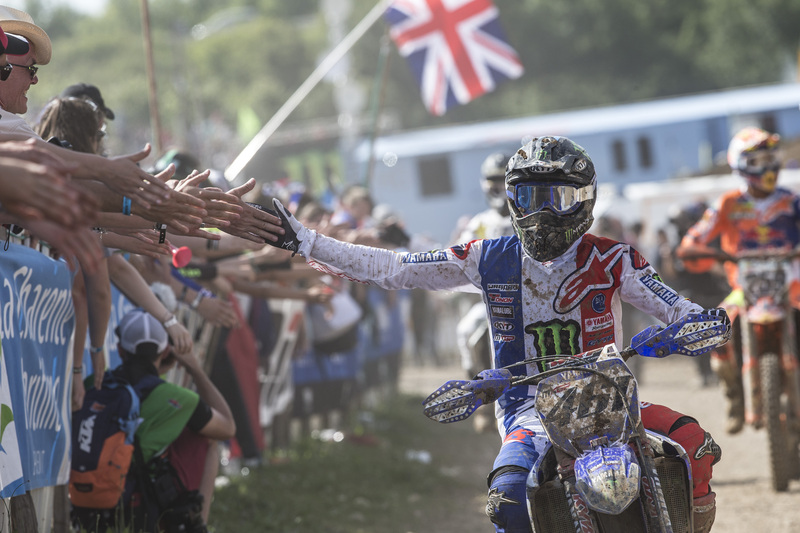 Jeremy Seewer got off to an incredible start onboard his Wilvo Yamaha Official MXGP YZ450F and rode a valiant race, holding off the former World Champion, Romain Febvre, for the entire 17-laps to match his best race finish of the season, sixth place. Meanwhile fellow Wilvo Yamaha Official MXGP rider, Shaun Simpson got off to mediocre start, but managed to fight forward and pick off the likes of Van Horebeek – who is one of only four Qualifying Race winners this season – to finish on the fringes of the top-ten, in eleventh place. Seewer put on quite a show for thousands of fans that crowded the hills of Saint Jean d’Angely, as he held off some of the biggest names in the class. Admittedly, it was the first time this season that the rookie had been so well placed off the start, and he tried to learn as much as he could about maintaining the high speed and intensity of the MXGP class for the entire race duration. He eventually came home in eighth place, which is where he finished in the overall Grand Prix Classification as well.